There are some experiences in one’s fishing career that become permanently etched in our minds. One of those experiences, I’m sure for many anglers, was catching their first fish or first trout. For me it was not catching that first fish as I had been salmon fishing in the ocean since almost before I can remember. That first trout, however was different. It was a very wet early spring Saturday morning and I had convinced my dad to drive my fishing buddy and I, both 9 years old at the time, to a local lake that we had read about in a weekly fishing report. Dad stayed in the car and read the paper while we rigged our spinning rods with dew worms and bobbers and began fishing. We stood on the shore of the lake in the pouring rain with eyes glued to the big red and white plastic floats, desperately wishing they would get pulled underwater. Then it happened, my float just disappeared in amongst the sea of big rings left by the pelting rain. I remember just winding the reel handle as fast as I could while feeling the big trout pulling against the rod. I ended up landing it by just walking backwards away from the lake and literally dragging the fish out of the water. It turned out to be my day as we left, soaking wet, but with a prized trout wrapped up in the morning newspaper. Now, forty something years later, I still enjoy watching a float, although much smaller versions have replaced those almost ping pong ball sized plastic ones of earlier years. There is just something about watching a small strike indicator dip or quiver as a fish picks up the fly whether suspended below the surface of a small lake or being guided by the current of a river. Strike indicators have been part of the fly fishing tackle bag for many years and their use or popularity has certainly increased in the past 10 or so years. Indicators are just one of many techniques available to both stillwater and river anglers. There is no question that they can be extremely effective when presenting certain life stages of insects and other trout foods at different times of the season. 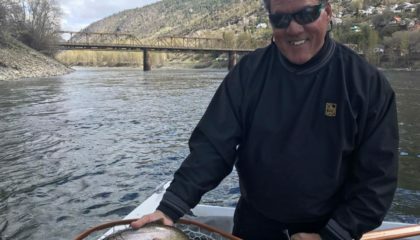 Some long time stillwater fly fishers suggest that strike indicators have made it too easy for “new anglers” and that these anglers have not paid their dues in learning the art of fly fishing. 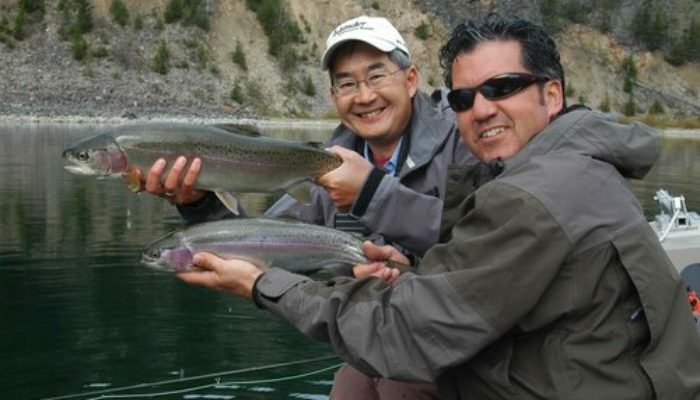 The bottom line, however, is that this technique works and those anglers that understand the life cycle of aquatic invertebrates and know something about lake structure and trout behaviour will always be more successful than those that have not acquired this knowledge regardless of the fishing techniques being employed. Indicators come in a large variety of shapes and sizes with new designs appearing almost yearly. They can be tied on or attached to the leader using toothpicks, plastic pegs, twisted rubber cores, sticky backed foam or formed with soft putty. Most hard-shelled designs are oval or tear drop shaped which perhaps make them more aerodynamic and easier to cast. They typically have an inner core of hard foam or balsa wood which is covered with a plastic coating. Yarn indicators of various shapes and sizes are also still popular. The strike indicators principal function is to allow a fly to be presented or suspended at a very precise depth while giving the angler a visual clue that a fish has taken the fly. In lake fishing, presentation depth can be a critical factor in determining whether one hooks or catches any fish during particular insect emergences or migrations. In many stillwater situations, the trout will feed closer to the lake bottom than higher in the water column. This serves at least two purposes: better protection from predators and easier foraging strategies as insect larval, pupal and nymphal populations are more concentrated closer to their benthic habitats. As insect pupae and nymphs emerge they spread out more through the water column and the trout have to work harder for their meals. The use of strike indicators in stillwaters is most commonly associated with midge or chironomid pupa fishing techniques. They work because the pupal stage of this insect can spend significant time suspended at specific depths in the water column prior to initiating the emergence movement to the surface of the lake. Often, the chironomid pupa will stage within about 12 inches of the lake bottom, perhaps completing the final stages of transformation from the larval to pupal stage. This pupal staging can last from a few hours to several days and often occurs in water anywhere from 5 to over 25 feet in depth. Trout locate these dense congregations and simply gorge on the helpless insects. Strike indicators are the best way to keep a pupal pattern suspended at these fairly precise depths. Often the pupae are staged or suspended in a very narrow band or depth zone within the water column and presenting flies outside this zone results in far less action. Finding the preferred pupal feeding zone on a particular day should start by covering the deeper water first and gradually working higher in the water column as the day and pupal emergence progresses. A depth sounder becomes an important tool in this type of fishing scenario. Set the strike indicator so that the pupal pattern is suspended within 6 to 12 inches of the lake bottom. If there is no action then adjust the indicator so that the fly is another 12 to 18 inches higher in the water column. This will ensure each potential feeding zone is covered. Fishing indicators in deeper water where the fly is suspended more than about 15 feet down can make landing a fish quite difficult as most indicators cannot be easily moved or slid down the leader. The typical scenario sees an angler standing in the boat, rod held as high as possible with the strike indicator jammed against the tip top guide and the fish still swimming around out of reach of the net. It gets even uglier when fishing leaders as long as 25 feet below the indicator. This is when a “slip style” or “quick release” strike indicator becomes very handy. These indicators are set at the desired depth and when a fish is hooked the added weight and pull on the leader from the fish triggers the release and the indicator slides down the leader. Strike indicators are also very effective when fishing flies tight to weed lines, edges of bulrush patches and openings in amongst mats of floating or submerged vegetation. These locations offer prime habitat for a variety of trout food sources including highly sought after scuds, leeches, damselfly and dragonfly nymphs and caddis fly larvae. Shallow water fishing situations generally occur during the spring and fall periods when water temperatures are ideal for trout to spend their entire time on the shoal or littoral zones of the lake. Even though the water can be quite shallow, often less than 6 feet deep, the dense areas of vegetation provide enough cover for the trout that they stay around for long periods of time. The strike indicator is again used to present the fly at a precise depth which at these times of the year is usually just inches off the lake bottom. The indicator can also keep the fly in a particular area such as a clear opening within a mat of submerged vegetation or within inches of the stems of bulrush or cattails. Leeches, damselfly nymphs and scud patterns are frequently used under an indicator in these situations. Once the fly has settled below the indicator an occasional short, but quick, strip retrieve is often enough additional movement to attract a fish. Often, the simple up and down motion of the fly from wave action is all that it takes to get a strike. Wind drifting a fly under an indicator can also be very effective when fishing along the outside edge of a weed or vegetation line. A slight breeze will push the indicator along in that gentle undulating motion that really does attract the attention of trout. Bead-headed flies should also be considered when using this style of fishing. This is especially true when fishing with very long leaders. The added weight gets the fly down faster, provides more undulating motion and adds additional flash to the fly. It is also very beneficial to use a non-slip loop knot which allows the fly to swing freely while suspended under the indicator, it can make a big difference in how much attention your fly may receive. Check out this video on how to tie a non-slip loop knot. Casting strike indicators can be awkward, especially if using larger or more wind resistant designs. One can avoid real messy leader tangles by widening and slowing down the casting stroke. 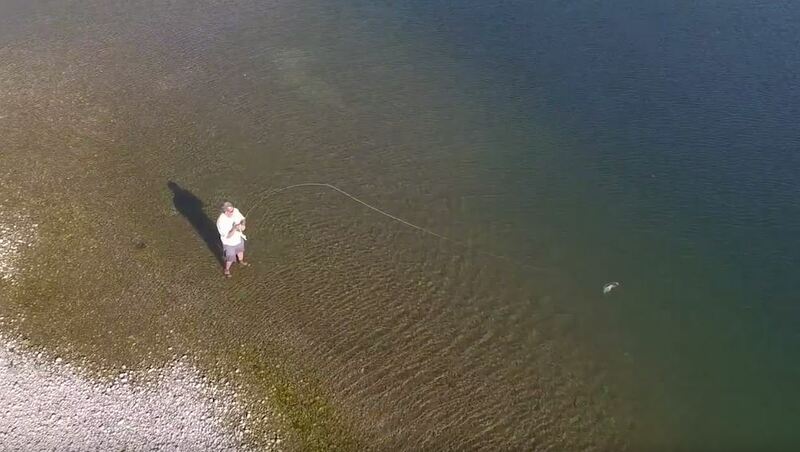 Long casts are not needed with the use of indicators as they can be very hard to see when floating around in choppy water 70 to 80 feet from the boat. Indicators come in a variety of colours with the most common being fluorescent orange and a fluorescent green. Many solid indicators are painted with a two-tone design of these colours. Light conditions will dictate which colour should be pointing up or down. It’s also important to consider the size of strike indicator being used. Larger ones are more difficult to cast and will not be as sensitive in telegraphing a subtle take of the fly. Smaller ones are easier to cast but can be more difficult to see particularly when there is a light riffle on the water or under low light conditions. A little experimenting will quickly determine the appropriate size and colour for your eyes under various surface water conditions. Strike indicators are just one of the many techniques used to present numerous stillwater food sources at certain times of the year. Anglers that have not tried them may be in for a pleasant surprise.